As y'all know, I'm a huge snail mail fan and send out letters every week to friends. While you may think snail mailing is a solo hobby, social media has made it, well, social. (When you want it to be). So when I think of it, sometimes I'll take pictures of my outgoing mail and tweet it with the hashtag #showandmail. 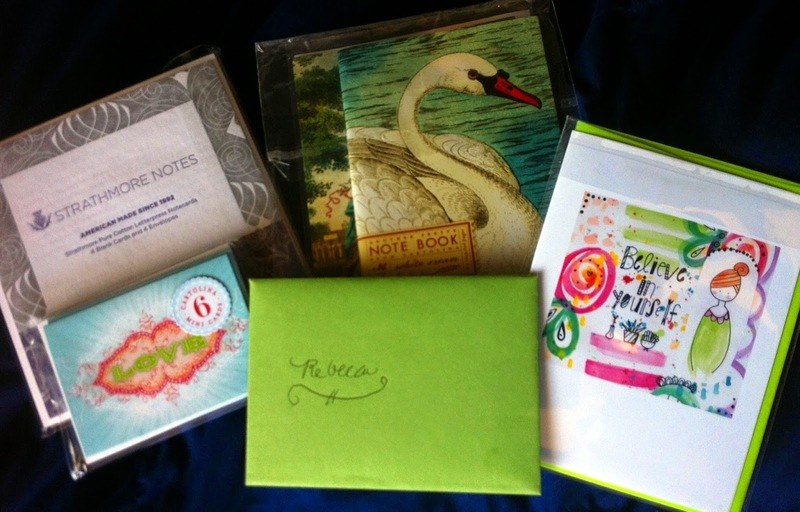 I've participated in some postcard exchanges and also follow some snail mail/paper-loving blogs, like the Letter Writers Alliance and The Paper Chronicles. Getting involved in my campaign (and getting some free stationery) is so easy. Just send me a letter, card or postcard on your favorite paper (which is most likely gathering dust) and tell me what makes it so. My address is: P.O. Box 22133, Beachwood, Ohio 44122. I will share it here, and then send you even more stationery. And if you are interested in being a sponsor, please reach out … I’d love to hear from you too! So, in February—after following the blog for over a year and meaning to write in once I was back in the states, I finally did. The other day the post went up on her blog, and today I got the package in the mail! The stationery she chose for me comes from Jenipher Lyn's Nightly Doodles, it's so cute and positive. Plus there were all of these other goodies included—it seriously felt like my birthday. So if you want to support the campaign, you can either write in to receive free stationery, or donate stationery by sending it in! Thanks so much Sarah and Jenipher. I've really been missing it lately, and wouldn't mind making the Camino a yearly event. To share the love and give you a taste of what it's like, I'm going to describe an average day on the Camino. When it comes out to people that I walked 780 km (~500 miles) in 26 days (or was it 27? ), it sounds like a lot. And while it was a faster pace than others, I'm convinced anyone can walk the Camino because you do it at your own pace. The Camino is not a race. And you're walking through towns and sleeping in beds, not roughing it. Days consist of waking up, walking, eating, talking, and sleeping. You can do those things, can't you? So let's start early in the morning when my days typically started. Rise and shine! Today’s article is written for the Reach To Teach Teach Abroad Blog Carnival, a monthly series that focuses on providing helpful tips and advice to ESL teachers around the globe. I'll be posting a new ESL-related article on my blog at the start of every month, and the carnival is always published on the 5th by that month's host. Check back for more posts, and if you'd like to contribute to next month's Blog Carnival, please contact Dean at dean@reachtoteachrecruiting.com, and he will let you know how you can start participating. This month's host is Holly Beddome of Adventures with Holly, which is where you can read all of this month's entries. Prompt: Write a letter back to yourself when you were just planning your trip. Give advice, forewarning, hopes and encouragement.